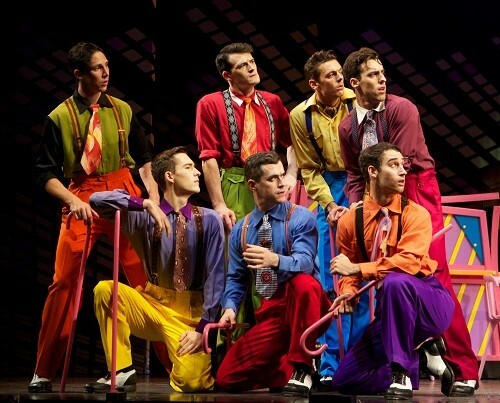 Before Tap Dogs and The Boy from Oz, Hot Shoe Shuffle paved the way as the first Australian musical to succeed both at home and internationally. It is one of the longest running multi-award winning musicals ever to be produced in Australia. It is a Tap Dance Musical Comedy featuring the big band hits of the 1940's and as one reviewer said includes "some of the most exciting dancing to ever hit a theatre floor". Conceived, directed and produced by David Atkins OAM it was choreographed by both Atkins and the now world-renowned tap choreographer Dein Perry. Hot Shoe Shuffle launched Dein Perry's international career and introduced Adam Garcia to both Australian and UK audiences and to international fame. Created in 1992, it has won numerous awards, played to literally millions of people and been produced in 6 different countries. After it's award-winning season on London's West End, it wowed audiences and broke box office records on the UK's regional touring circuit, where it toured for 2 years. It has played sell-out seasons in Australia, Japan, New Zealand, Canada and the United States. In London, the production won the prestigious Lawrence Olivier Award for Choreography. It has also won an ARIA Award for it's soundtrack album, 4 Mo Awards, 2 Green Room Awards, and an Advance Australia Award for services to the Arts. To date there have been 3 television specials made on the production – one in Australia, one in London and one in Japan. The last time Hot Shoe Shuffle toured Australia was in 2002 on an unprecedented scale playing across the country in 33 cities over a period of 7 months! It is regarded both commercially and critically as one of the most successful Australian musicals of all time. During it's last season in Sydney it broke the box office record at Her Majesty's Theatre for the most tickets sold in a single day, a record previously held by the Disney blockbuster Beauty and the Beast. 2013 marks Hot Shoe Shuffle's 21st birthday, and to celebrate that milestone David Atkins Enterprises is creating a new production which will tour Australia, with a United Kingdom and European tour to follow in 2014. This new production of Hot Shoe Shuffle is set to wow old fans and create a whole new generation of new ones when it hits Australian stages in 2013. The seven Tap Brothers (Spring, Slap, Buck, Wing, Tip, Tap and Slide) learn of the death of their long-absent father, who has apparently left them a fortune. The only catch is that to receive their inheritance, they must rehearse and perform his legendary 'Act’ – the Hot Shoe Shuffle!! In addition, the must also include their long-lost sister, April, into The Act. The only problem is – she has two left feet! Coached by a friend of their fathers, Max Renfield, the brothers eventually overcome their resentment and suspicion of April, and she becomes part of the family and the show. A twist in the plot reveals that the inheritance tale is a ruse to bring the family back together again, and the Hot Shoe Shuffle is finally performed triumphantly, in the tradition of the best Broadway musicals.